Malcesine’s pedestrianised cobbled streets lead up from the lakeside, past shops, cafés and shady squares to the 13th Century castle which towers above the lake on a sheer rock face. The Saturday market is not to be missed and the excellent ferry service makes Riva and Limone easily accessible too. The long promenade leads out from the resort’s southern end past shingle beaches to lovely Val di Sogno, an idyllic spot for lake bathing and watersports. Take the cable-car to the top of Monte Baldo behind Malcesine. Here you will enjoy superb views, an abundance of walks and beautiful nature. With so much variety and character, your holiday in Malcesine is an ideal choice. A night at the opera in the ancient arena in Verona must surely be one of life’s great experiences even if you’re not an opera buff. The 2018 programme (22 June - 1 September) with all-time favourite Aida by Verdi loved for its lavish scenery and costumes. A new stage design for Carmen by Bizet, there are also performances of Nabucco by Verdi, as well as Turandot by Puccini. 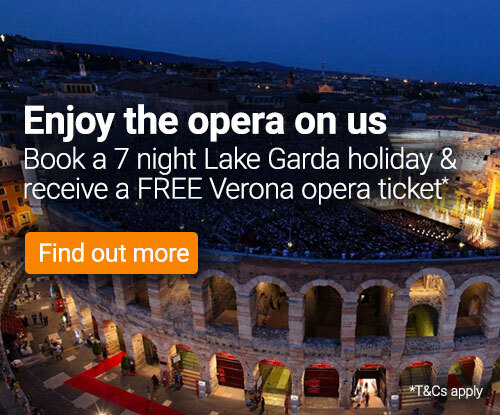 If you are staying in any of the main resorts on Lake Garda, we can book most performances (listed on the Verona Opera page) and transport to & from Verona is included in addition to your opera ticket. Six classic Italian villas have been converted into a lovely hotel set in beautiful gardens. From its elevated position above the lake, Hotel Capri is privvy to some of the most dramatic views Malecesine has to offer. Enveloped by verdant gardens, lemon and olive trees, this chic yet comfortable property has been a long standing favourite of Inghams guests. Boasting a superb lakefront location, Hotel Excelsior Bay is one of the most popular hotels in Malcesine. Known for its stellar reputation of service and culinary excellence, this is truly one of Lake Garda's hidden gems. The Cristallo is a comfortable well-maintained 3 star run by the Moretti family. It is 15 minutes' from the resort centre and 1 minute from the lake. The family-run Internazionale is attractively situated on a slight incline amongst olive groves, close to Malcesine’s cable car and attractions. The Hotel Malcesine is situated in prime position on the lake front in the centre of Malcesine. Offering superb facilities and attentive service, this superior hotel boasts a stunning, peaceful setting on Val di Sogno’s delightful bay. The pretty lakeside path brings you to Malcesine, 2 kms away. Tourist shuttle to Malcesine centre stops nearby. Enjoy a most scenic lakeside setting at the Prima Luna, just opposite the pretty beachfront. Enjoying an enviable position just moments from the lake itself, the Hotel Astoria ensures comfortable surroundings away from the hustle and bustle of central Malcesine. A popular, informal, family-run hotel with good service, located right in the centre of Malcesine beside the historic harbour. Transfer Approx. 1hr 30mins by coach. Supplements: are based on 7 nights departures. Inghams Saver Plus: Save £50 per couple for Summer 2019 departures - whilst stocks last! FREE EXCURSION | Pre-book 3 excursions per person and receive Verona* full day FREE. Please note: Only one Verona opera booking per person can be counted towards your 3 excursions. Spend the day sipping some of the finest wines of the Veneto and Trentino regions in the sunshine. Discover the secrets of wine making and enjoy a small snack with a selection of full bodied fresh, refreshing whites and vibrant rose. Explore the resorts of Lake Garda with one of our fantastic tours. Take a coach down the famous Gardesana road and cruise the crystalline waters on a boat trip to resorts with time for shopping, sight seeing and lunch. Drive through the scenic South Tyrol right through to Pass Pordoi and immerse yourself in the vibrant countryside of the Dolomites. Stop for a drink at one of the Refugio's or explore the flora and fauna on foot during this guided tour. This spectacular guided tour offers you a full day in the rich and decadent city of Venice. Including coach and water taxi transfers, our tour leader will guide you through the sights and on a gondola before you enjoy free time to explore this enchanting city at your own pace. An extended version of our exceptionally popular classic tour, this package gives you extra time in the magical city of Venice as well as a trip on a motorboat to visit the Laguna islands. Visit one of Italy's most popular citta d'Arte and traverse this spectacular medieval city which is home to the Roman Ampitheatre, Juliet's balcony and the stunning Via Mazzini. Take the coach down to the cobbled streets of Milan and spend the day immersing yourself in the stunning architecture of this industrial city. Please note we act at all times as selling agent for the suppliers of activities & excursions. See terms & conditions. Timings are approximate and subject to change. The Saturday market is a highlight of all Malcesine holidays and is not to be missed. The excellent ferry service makes Riva and Limone easily accessible too. The long promenade leads out from the resort's southern end past shingle beaches to lovely Val di Sogno, an idyllic spot for lake bathing and water sports. Take the cable car to the top of Monte Baldo behind Malcesine. Here you will enjoy superb views, an abundance of walks and beautiful nature. With so much variety, Malcesine, Italy is an ideal holiday choice. Two Centres | You can combine your 7 night stay in Malcesine with 3, 4 or 7 nights in Venice or Verona, or with a stay in Merano or Selva in the Dolomites.